Joe Allen played junior hockey in Romford and Guildford, but it was with the Invicta Dynamos in 2007/08 that he had his first taste of senior hockey as Head Coach Kevin Parrish signed him up for his ENIHL side. A 17 year old Allen played in 37 games for the Mos and scored 16 times whilst tallying an impressive 32 assists for a total of 48 points. His pace and work rate made him stand out and were a significant factor in the Dynamos finishing top of ENIHL South Conference B. 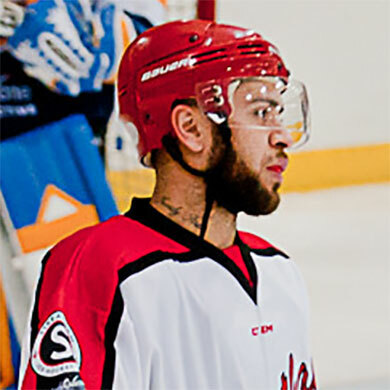 The following year Joe Allen switched to Romford where he would feature in the ENIHL’s second tier with an eye to progressing to the EPL and he would succeed in making that step up come 2009/10 as he dressed 33 times for the Raiders – netting 4 and playing a role in 5 more in the league above. Financial difficulties saw Romford become a part of the ENIHL themselves in 2010/11 and Allen remained with the Gold and Blue for a further term before taking a year out of the sport. By 2012/13 Allen was back in the game, this time icing for Streatham in the NIHL South Division 1. It is here that the forward has spent the majority of his senior career as he returned to the South London club year after year to play a total of 6 consecutive seasons in the capital. In 170 league appearances Allen found the target 44 times whilst also contributing 86 assists for a total of 130 points. Perhaps lesser noted than his points tally, but just as valuable, was his considerable contribution to the Streatham forecheck and battling performances on the penalty kill that made him a key figure in the Redhawks line-up. In 2015/16 Allen wore the ‘A’ of Alternate Captain for the Londoners but now he brings his experience, work ethic and points gathering abilities back to where his senior career began – to Kent and the Invicta Dynamos.